We have updated Faculty Websites to the latest version of WordPress – 3.5. The biggest change is the new media manager. This makes uploading and managing photos and other media much easier. 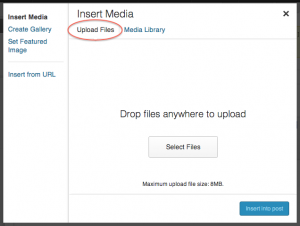 New, more intuitive interface for uploading and managing images. Create galleries faster with drag and drop ordering, inline caption editing and more simple controls. Included in the update is a new theme called Twenty Twelve. It’s mobile friendly, responsive design is also simple and elegant. We’ve decided to not make it the default as Twenty Eleven (also responsive) has more features. However, you can try it out by selecting it under Appearance > Themes. WordPress has deprecated the Link Manager tool. If you are already using it, it will not go away. However, for new Sites or Blogs, it will no longer appear. If you need this functionality, contact us and we can install the plugin for you. The options to make your site available to Search Engines is now under Settings > Reading instead of Settings > Privacy. If you use the HTML editor in Posts or Pages, the tab is now called “Text” instead of “HTML”, but retains the same functionality.